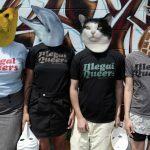 This week’s show is an interview with Lee and Emily, members of the Seattle Solidarity Network. “Seattle Solidarity (“SeaSol”) is a volunteer network of working people who believe in standing up for our rights. Our goal is to support our fellow workers’ strikes and struggles, build solidarity, and organize to deal with specific job, housing, and other problems caused by the greed of the rich and powerful. This week’s show features a conversation with Katie Burgess of the Trans Youth Support Network about the case of CeCe McDonald. Chrishaun âCeCeâ McDonald is a young African American transgender woman who is charged with two counts of âsecond degree murderâ after an incident that began when she was violently assaulted because of her gender and race. We’ll talk about some of the realities of how gender and race are dealt with by police and prisons and critiques of the effectiveness of Hate Crimes legislation. There are 3 upcoming days of action around the case: 11am on 11/21/11 in Minneapolis, a day of call-ins/faxes/emails on 11/22/11, and court solidarity on 12/05/11. This week’s show features an interview with former Asheville resident and current resident of Oakland and an organizer of the Occupy movement there. 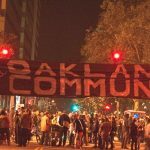 We talk about the police attack last Tuesday, the differences between the Oakland movement from other Occupy’s and the upcoming call for a General Strike. I’ll also be talking briefly about the upcoming solidarity march (Wednesday the 2nd) here in Asheville starting at 6pm under the Lexington/I-240 bridge, and the protest this Friday in Raleigh at the Department of Corrections offices. Bursts spent the hour speaking with Martin Ramsey, a wob who’s also a member of the Occupy Asheville Anti-Authoritarian Anti-Capitalist Caucus (Anti-Anti). 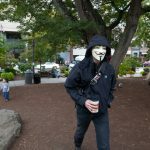 We talk about some of the potentials of the Occupy movement and the place of anarchists, autonomists and other like-minded folks in the Asheville wing of it. 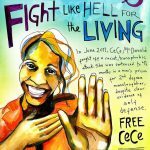 But, first, we talk a bit about Occupy Asheville and the resumption of hunger strikes by prisoners in CA. Prisoners there are claiming that the state officials have not implemented any of the rights demanded by hunger strikers in July. 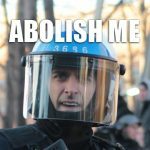 AND the CDCR (California Department of Corrections & Rehabilitation) has stated that it will be punishing hunger strikers as if they were rioters. 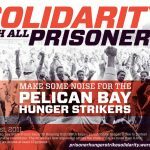 Please support their cause, starting by visiting Prisoner Hunger Strike Solidarity to keep up on news. 200 to 300 bodies occupy the space and sleep on the street right next to Wall Street, financial hub of the east coast. To some, the place symbolizes the living and breathing Sacre Coeur of Capitalism, the highest stage of human global awareness and economy. A system offering to break down monolithic governments and swap them for more democratic ones and to scoop the ingenious and hard working out of poverty, it’s promoters often present it as a panacea. Capitalism’s detractors range from the belief that it’s a necessary evil to an alienator of communities and a destroyer of worlds. This Friday will mark day 13 of the Occupy Wall Street protest. Those occupying the space of Liberty Plaza were definitely influenced by the occupation movements of the “Arab Spring” and the attempted anti-electoral occupations in Spain and have set off many related, if smaller, occupations around the United States (Chicago, San Francisco, Los Angeles…. in fact 64 listed in total so far in North American and 12 internationally found on occupytogether.org). 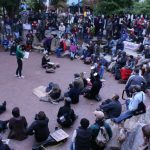 This Friday, we’ll discuss the movement and the upcoming (Saturday, Oct 01) protest in solidarity with the occupy movement as well as other related initiatives coming out of Asheville. In November of 2008, 13 identified individuals entered a mega-church in Lansing, MI, known for it’s active anti-gay stance and organizing. These 13, deemed the Mount Hope Infinity as the number of Jane and John Does (20) kept growing in the civil law suit that followed, threw leaflets telling the congregation (particularly the youth) that it’s ok not to be straight, kissed at the pulpit and chanted slogans. A two and a half year civil suit was subsequently brought by the Alliance Defense Fund (a legal group devoted to the end of persecution to Christians) under the auspices of the “Freedom of Access to Clinical Entrances Act” (a law passed to stop people from blocking access to clinics that offer abortions). This week’s hour is a discussion with one defendant about the case, the events and the aftermath.